The 2017 wrestling season for Goodhue Wrestling is underway! The high school program will kick off the season Friday after school, on short notice due to football ending early and the wonderful weather we’re having in early November. After cleaning up our adopted section of Highway 9, the team will head to the O’Reilly’s to grill food, have a bonfire, and play games. All wrestlers in grades 7-12 are invited! The high school program begins with practice on Monday, November 21st. Next week, the elementary has their registration night on Wednesday, November 9th. See that post for more details. The youth open with their first practice on Sunday, November 20th. The high school program’s Parent-Athlete-Coach meeting (PAC) will be the following night, Thursday, November 10th. At 6:30, all winter sports participants will meet in Gym #2 for general rules and information. Afterwards, each sport will break out into separate areas of the school to provide information for that sport only. Apparel orders are due November 11th, and either one of the events on Wednesday or Thursday are great times to submit your orders! 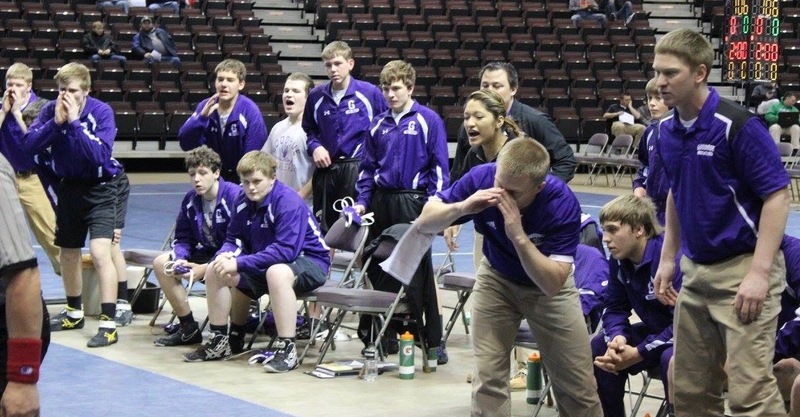 Goodhue Wrestling apparel is available through next Friday, November 11th. Submit to the school (attn: Coach Grant) or turn in at Elementary Registration Night (Wednesday 11/9) or the HS Winter PAC Meeting (Thursday, 11/10). 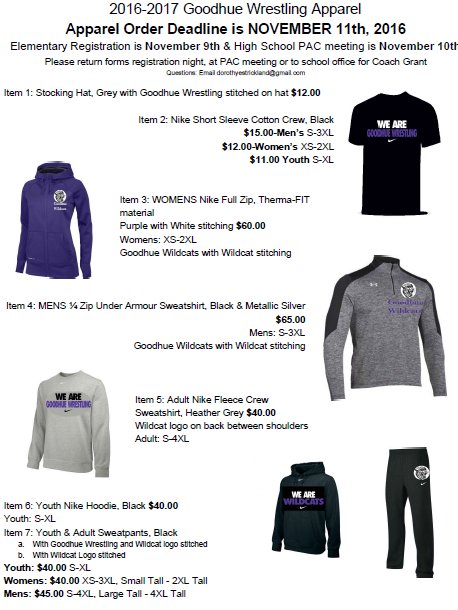 New this year is Nike-branded clothing, and optional ‘wrestling’ or generic ‘Goodhue Wildcats’ screen-printed/embroidery. Links to the flier and order form are posted in the HS & Elementary Document Libraries on the website, and are linked below; check them out for more details.